The representation of public and private interests plays a key part in the functioning of the European Union (EU). As long ago as 1958, Ernst Haas suggested that the activities of interest groups could partly explain the development and functioning of the (then) European Economic Community (EEC). First, they could form an important means of contact between the rather remote central institutions of the EEC, then chronically lacking in democratic structures, and the populations of the member states. 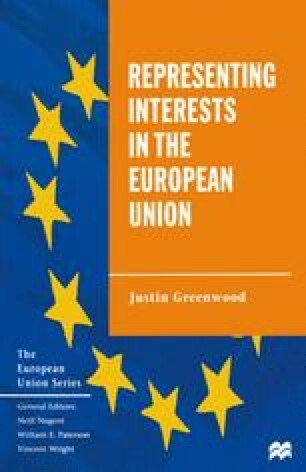 In so doing, interest groups could play a key role in legitimising the decisions of the EEC, and in relieving the ‘democratic deficit’ so characteristic of the early days of the Community. Second, in trying to take advantage of the opportunities presented by a European single market envisaged in the Treaty of Rome, business interest groups, Haas suggested, would encourage the progressive transfer of competencies from the national to the European level. Indeed, the ‘relaunching of Europe’, culminating in the Single European Act (SEA) of 1986, arose in part from the demands of a group of business leaders from Europe’s largest companies, worried about losing out in global competition to Japan, America and the newly industrialising countries of south-east Asia. For the businesses they represented, a European single market was, at the bottom line, a strategy for survival.